"One of the best books I have ever read about a rock musician. Honest, funny and, in the end, very moving. It is a great tribute to Rory, and more than that one could not ask. All those who loved Rory, and there were many, will be incredibly grateful for this book." "...a singular twist on the rock 'n' roll myth. We never quite crack the Gallagher enigma, but our appreciation is greatly enhanced." "...a frank and at times moving account of life with Rory, seen from the other side of the stage. Required reading for fans." "Riding Shotgun presents a complex picture of a man who was charming, polite, painfully shy, obsessed with music, passionate about the blues, driven, often distant, probably lonely, careful with money and definitely a control freak. 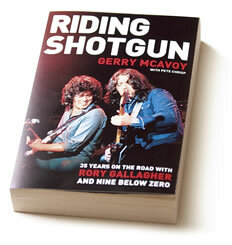 McAvoy's tribute to Rory Gallagher makes fascinating reading." Just a few of the comments made in the press, on television and on the official Rory Gallagher website about Gerry McAvoy's long-awaited autobiography, Riding Shotgun. Here you can find out more details about the book and place an order.